COMPASSIONATE CLIMATE ACTION: 9 Days to Copenhagen - Are We Ready to Make Sacrifices for the Sake of Our Children? 9 Days to Copenhagen - Are We Ready to Make Sacrifices for the Sake of Our Children? Quite invisibly to the public eye, psychologists from around the world — especially those who specialize in conservation psychology and/or ecopsychology — are wrestling with the question of how to help people move towards behaviours and lifestyles that will lead to sustainability. As an educator, I get to sit on the sidelines of these listserves and listen in. Sometimes I contribute a thought or two. Recently, some of the discussion focused on "framing" our messages so that people will listen and take them to heart. In this discussion, a dichotomy seemed to be set up between what's called "motivational framing" (which, according to some research, increased "perceived competence") and "sacrificial framing" (which apparently decreased perceived competence to take action and make changes) (Louise Comeau, Royal Roads University). Put another way, "encouraging competence is more effective than emphasizing sacrifice" (Robert Gifford, University of Victoria). Have we (as a society) actually done much asking of people to sacrifice? Sacrifice as in "the act of giving up something valued for the sake of something regarded as more important or worthy"? Or, in our research, are we just asking people how they would feel if we asked them to give something up? The word "sacrifice" comes from the Latin sacer, meaning "holy," which reminds me of a point my husband and I have been discussing recently. Does behaviour change come more easily to people who hold the Earth and life as sacred? And are those people more willing to make sacrifices for the sake of the greater good? I ask because I have a hunch that asking people to make sacrifices for the sake of their children's future well-being in a carbon-constrained and climate-wracked world might actually work. If we appealed to their sense of love and compassion and "ancestorhood" (I suppose as a way to "frame" what we're asking for), we might be surprised (in either direction) by the reaction and results. This last idea came to me accidentally, several years ago, when I showed An Inconvenient Truth to three social studies classes in a secondary school and asked the students to write down the one thing that struck them most from the movie. The vast majority of these bright kids said it was the visualization of sea level rises. That's when I realized that people have to be able to "see," in their mind's eye, what's going to happen to their children if we don't halt the carbon emissions. But when you do that, you are accused of presenting doom and gloom, of being a doom monger or an alarmist. Man, are our kids ever going to be pissed off with us when they realize what we didn't do because we were oh so afraid of being labelled "alarmist." So, my question stands. Are we actually asking people to sacrifice today for the sake of their children's tomorrow? 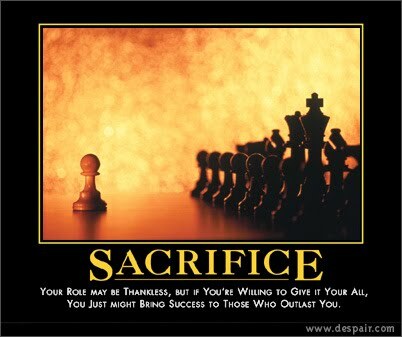 Sacrifice as in "the act of giving up something valued for the sake of something regarded as more important or worthy"? If EuroAmericans truly love their meat and their cars and their money more than their kids, let's find that out now.